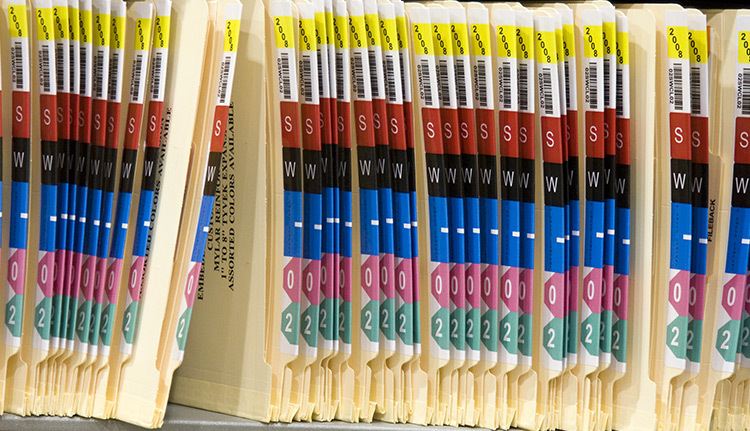 Color code file folders from FSS can reduce filing and retrieving time by 50% and save as much as 33% of the money spent on non-color coded files. A good color code system can work for your files, and in most cases pays for itself in less than a year due to the time saved in filing and retrieval without misfiles. Color coding is the assignment of color to a number, letter or particular item that shows meaning. In filing, we assign a color for each number 0 through 9, and a color for each letter A through Z to aid in filing and retrieval of all types of hard copy. By putting these colors (letters, numbers and designators) in a particular position on a file folder, file pocket, etc., a color/block pattern is formed. When these patterns of color are broken, a misfile has occurred. End tab file folders use the most efficient filing method, which is open shelf. Folder tabs are one position (reducing the effort used to read labels) and full cut (for name and color code labels). Folders have label placement score marks, undercut fronts for label visibility and score lines allowing 3/4” expansion. Selecting a folder with fasteners or pockets adds extra security to your documents. Expanding retention pockets can easily be attached to the inside of a fastener folder or binder, creating a filing solution for those documents that should not be hole punched. These file folders are ideal for disks, annual reports, evidence and project reports. Plastic binders from FSS come in a variety of styles, shapes and colors, all of which are easy to customize.